Patrick craves Chinese food at least once a week. Before we started traveling, every time we decided to go out to eat it seemed that he requested either Chinese food or pizza. So he had high expectations for the culinary delights we would experience in China. Really, we did have some amazing dishes. But we also had our fair share of strange and just plain bad food. 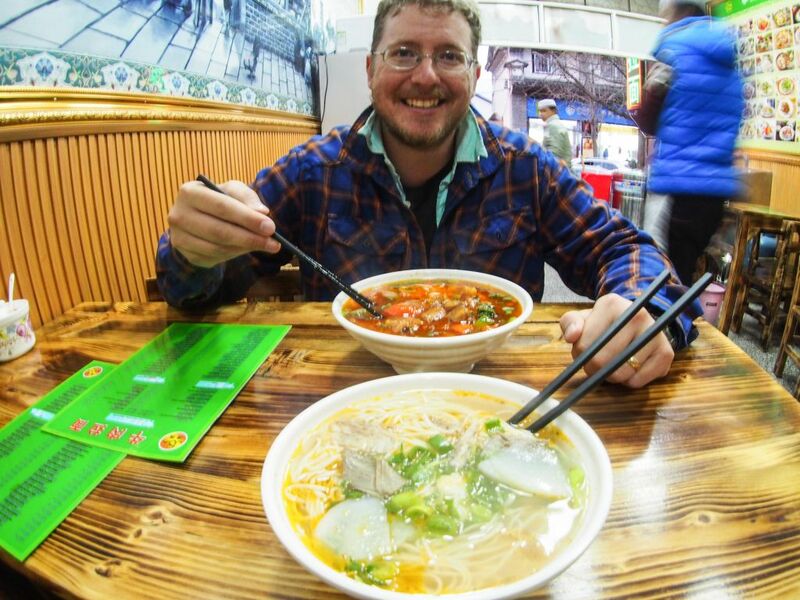 Food in China, at least for us American tourists, was quite an adventure. First of all, English is rare in China, even in restaurants. Dinnertime would find us wandering the streets, ducking into a restaurant here and there. When we came upon one that had pictures either on the wall or on the menu we’d eat there. Our ordering involved a lot of pointing. Sometimes we ended up with the most delicious dumplings we have ever had. Other times we got cold black fungus and preserved beef salad. Secondly, there is just a lot of food in China that we are not used to eating in the states. Did I mention the cold fungus salad? Street vendors sold scorpions and cicadas on a stick. Some offered what appeared to be cocoons. At one restaurant we had a delicious hot pot with a very curious type of meat. Places advertised “Hot Cheese and Cereal Milk Tea.” I’m assuming that since they were advertising it that somehow sounds appealing to people in China. Personally, the description alone makes me gag a little bit. 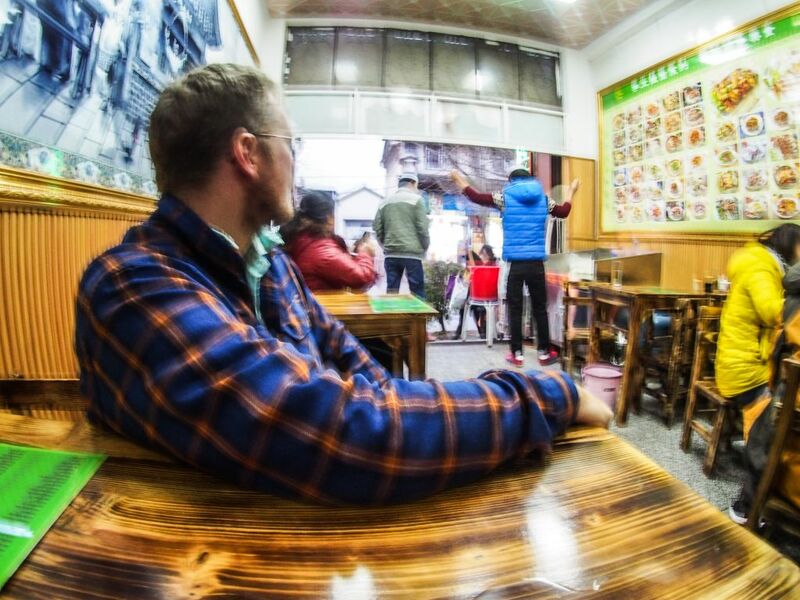 China is so different from what we are used to in America that the chances of randomly pointing at something disgusting on a menu are greatly increased. But, as we said, some of the food was amazing. So here are some of our greatest hits. In Dali we happened across a restaurant that advertised the English translation of their name “beef noodle soup.” Very promising. As it turned out, the menu was in both Chinese and English and we ordered a bowl of “braised beef noodle”. It was one of the best dishes we had in all of China. Upon ordering a man began hand pulling noodles right there in front of us. His skill was impressive and fun to watch. From here out I will always order hand pulled noodles if available. The noodles were doughy without being undercooked and the broth was delicious. The street food usually worked out pretty well as well, and was typically cheaper than eating at a restaurant. You can easily find steamed buns, meats on a stick (beef, pork, squid), spicy tofu, et cetera. We stuck to steamed buns, which never disappointed. We also discovered a place that made French fries covered in Chinese spices. We went back twice. The other benefit to street food is that you can actually see and smell what the food is that you are ordering. 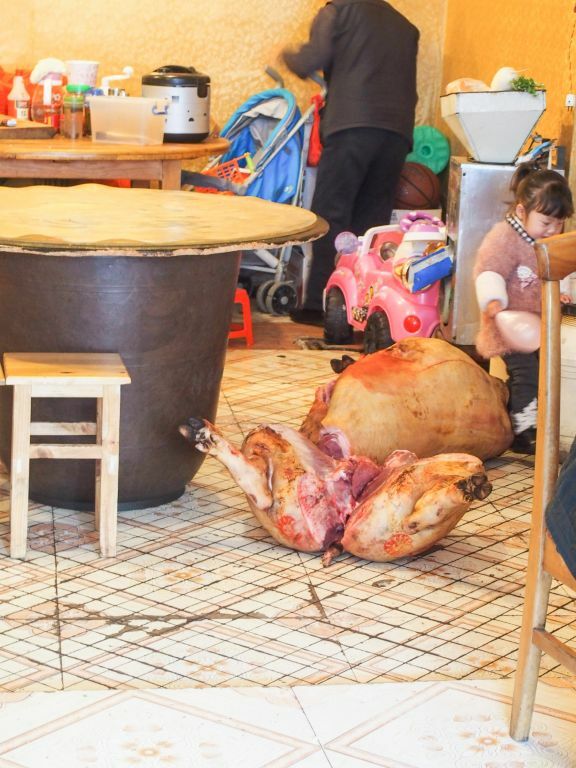 If you are in China, you should try some street food. Finally, on our last day in China we randomly wandered around Beijing looking for a shopping center. We found a little mall that had several empty shops inside. I assume the place is pretty new or perhaps being refurbished. Not deterred we ventured to the basement level in search of food and found the most delicious handmade dumpling restaurant. I wish we had found this place earlier so I could eat there again and again. Not only was the food here much better priced than the restaurants around the tourist spots but it was way better too. If only I could remember the name. All I know is that it somehow included the words king, oriental, and dumpling. Some of the food in China was quite tasty. Almost none of it actually tasted like Chinese food we eat at home. The dumplings and buns were the same for the most part, but the entrees were not. Most Chinese food in America seems to involve thick, often sweet, sauces. That wasn’t the case with the food we found in China. Although, China is a very big country so it could very well be that we just weren’t in the right province. What’s the best and worst Chinese food you’ve ever had? What on earth is that last picture? Oh just a food delivery that came in through the dining room while we were eating breakfast.